Jasper Morrison's first interior design project in Japan is a Tokyo shop that mimics the layout of a typical house and garden. 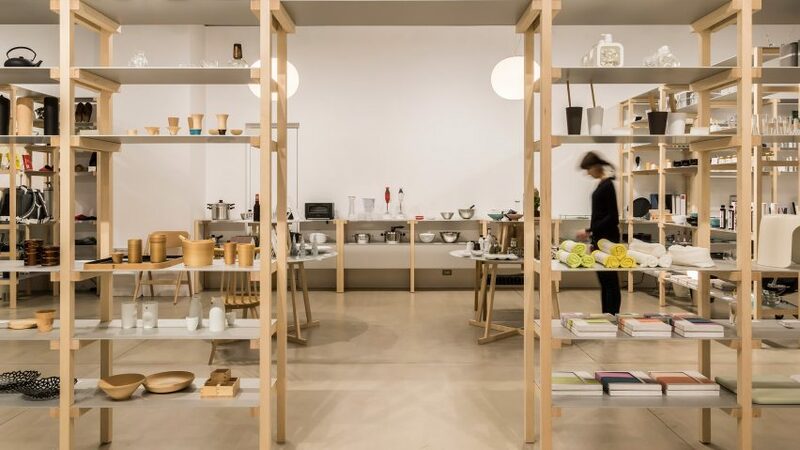 The British designer created the Good Design Store as a retail space for Japan's Good Design Award, a 60-year-old programme that gives a seal of approval to outstanding examples of design. His aim was to make the store feel homely, so he divided the space up into a series of "rooms" that are surrounded by wood and metal display shelves. There is a dining room, a living room and a hobby room, as well as a space known as the front garden. Each area's products reflect the room they're in, with furniture and decorative items in the living area, kitchen utensils and tableware in the dining room, and gadgets and stationery in the hobby room. The garden area at the front of the shop is used as a welcome space to entice passersby, but doubles as a display area for new products and small exhibitions. The shelvings units are made from simple, rectilinear components – typical of Japanese design. He paired contrasting materials, combining maple wood with aluminium and brass screws. Other details are kept to a minimum, with the surrounding concrete floors and muted colours allowing the shop's products to stand out. The Good Design Award has ben running since 1957, and its G Mark symbol is used to denote excellent design. It was started in Japan but, although there are several Good Design stores in Hong Kong and Bangkok, this is Tokyo's first. Products that have recently been awarded the Good Design Award are displayed on a series of low round tables also in metal and wood, echoing the shelving. "We believe that you will discover new comfort here, and you will find this shop to be a place where you can design a future pleasant life," reads a statement from the design team. Jasper Morrison is one of the world's best-known designers, and has produced products for some of the world's leading furniture brands, including Vitra, SCP, Emeco and Cappellini. He was the fifth ranking designer on Dezeen Hot List 2016. Recent projects by the designer, who now has offices in London, Paris and Tokyo, include wood and steel tables that recall the shapes of letters and Camper sandals that reference tatami mats.